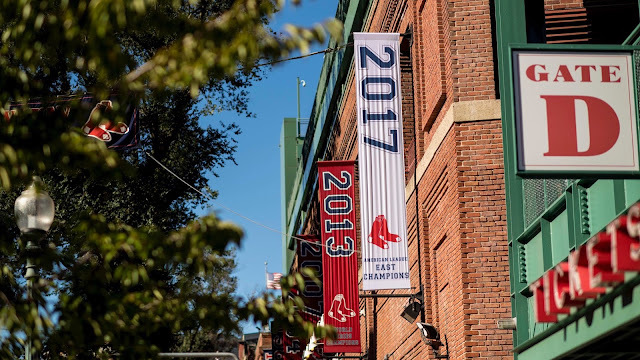 For the first time in the Red Sox 116 year history, the club has won back-to-back AL East titles. Finishing with a 93-69 record, Boston won the East by two games and will now head to Houston to open the ALDS on Thursday. Without Chris Sale leading the Red Sox rotation, Boston doesn't come close to touching 93 wins along with winning the a division title. Sale lead the league with 308 strikeouts, falling just short of Pedro Martinez's Red Sox record of 313. Sale's 2.90 ERA was second in the AL, and his 12.9 strikeouts per nine was tops in the entire MLB. Sale also started 32 games for the second time in his career, recording 17 wins in 214.1 innings. Almost all season, Sale appeared to be a lock for the AL Cy Young and even had a case for the AL MVP. After a few poor outings and an unbelievable run by Cleveland's Corey Kluber, the Cy Young and MVP might not be in Sale's destiny. Even if he walks away without any hardware, Sale's historic season cannot go without any recognition. Sale will finish either first or second in the real Cy Young voting for the American League and was easily the best pitcher in the Red Sox rotation this season. Down from a MVP worthy season in 2016, Betts still the best bat in the Red Sox lineup. Mookie lead the team with 24 home runs and 102 RBIs, while tying his career high with 26 stolen bases. Mookie's 46 doubles (career high) and 72 extra base hits easily lead the way for Boston. He also shattered his previous high of 49 walks, drawing 77 in 2017. Betts has carried one of the hottest bats for the Red Sox over the past two weeks, hitting .294 with two homers and 12 RBIs. His bat needs to continue to stay hot if the Red Sox want any success this postseason. Defensive Player of the Year - Jackie Bradley Jr. 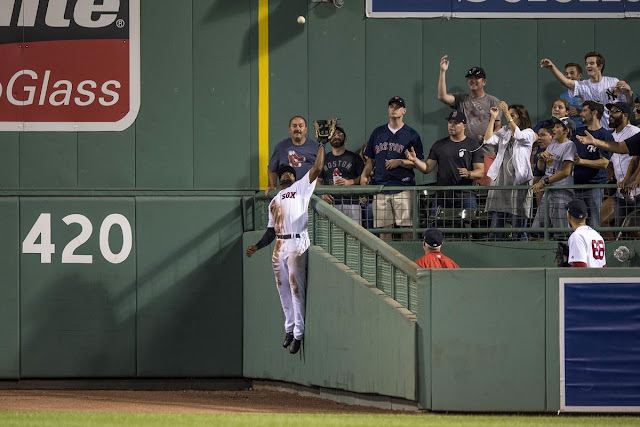 Almost every game it appeared Jackie Bradley was making an unreal play in center field, whether its robbing Aaron Judge in the Fenway triangle or gunning out runners at home. In 310 chances this season, Bradley recorded 300 putouts, six assists and just four errors. His fielding percentage was the best of any Red Sox starting outfielder at .987. With Bradley in center field, the Red Sox have perhaps the best defensive outfielder in baseball. He most likely will be a gold glove finalist and has a strong argument to win his first career gold glove. Craig Kimbrel was dominant all year out of the Red Sox bullpen. Throughout the first half of the season, hitters struggled to even touch Kimbrel. He posted 35 saves and posted a 1.43 ERA, down from 3.40 from last season. Kimbrel posted an astonishing 126 strikeouts in 69 innings pitched, striking out more than half of the batters he faced. He tied a career low with just 14 walks and a career best 1.8 walks per nine innings. His dominant season also included an immaculate inning against the Brewers. Benintendi opened the season as one of the favorites for AL Rookie of the Year, but appears to have been passed by New York's Aaron Judge as the favorite. That shouldn't diminish what Benintendi did in his first full season in Boston, as the 23-year old put up outstanding numbers. Benintendi became the youngest outfielder to hit at least 20 home runs and steal 20 bases since Barry Bonds did so in 1987. His 90 RBIs were second best on the team and tied for third out of all rookies in the entire league. He also made a defensive impact felt in left field, finishing the season with 257 putouts and 11 assists. The best move by Red Sox management all season was calling up top prospect Rafael Devers. The Red Sox were getting no production from the third base position, but that changed as soon as Devers was recalled. In 58 games, Devers hit 10 home runs and 30 RBIs with an average of .284. He provided an instant spark in the lineup, slugging .482 and carrying a .820 OPS, both team bests. The other top acquisition was dealing for utility man Eduardo Nunez. Nunez hit .321 since arriving to Boston, but struggled to stay healthy. Both Nunez and Devers played huge roles in kickstarting an offense that seemed dead in July. After dealing for Pomeranz last year, he disappointed greatly posting a 4.78 ERA in 13 starts. After a rough start to this year, it appeared Pomeranz was headed down the same path. Pomeranz rebounded from his early season struggles and clearly established himself as the number two pitcher in the rotation. He finished the season with a 3.32 ERA and a career high 17 wins. The surprise resurgence of Pomeranz is one of the biggest reasons the Red Sox are where they are today and he's locked in to start Game 2 of the ALDS. After a career year in 2016 that earned Porcello the American League Cy Young, the righty had no success this season. Porcello saw a 22-4 record sink to 11-17, the 17 losses led the entire league. His career high 2016 ERA of 3.15 also dipped down to 4.65. The expectations for Porcello were not another 20 win season or low 3.00 ERA, but what he produced in 2017 was a huge disappointment for the Red Sox pitching staff. His role in the playoffs is now left undetermined, as he could be in the rotation, bullpen or perhaps even left off the roster.